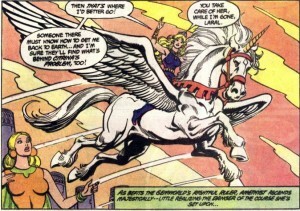 The cover of this issue features Amethyst on her flying unicorn. She’s in the clouds with castle Amethyst in the distance. She’s surrounded by a ring of glittering gems. The title of this issue is “Sleepwalkers”. Amy has fallen into a deep slumber on Earth, and the spirit-form of Amethyst has journeyed to the Gemworld in answer to Citrina’s call. Carnelian is spying through Amy’s bedroom window with a specialized stalker’s periscope. It is good to know that he is still creepy in his teenage form. Mrs Winston is getting hysterical about Amy’s unnatural sleep, but Emmy stops her from trying to wake Amy. Amethyst consults with Citrina’s handmaiden Laral to try to figure out what is happening. It is rather difficult to hold a conversation because the sleeping witch-mother keeps floating away. Amethyst tries to snag Citrina with her magic, but Citrina’s mystical cocoon repels her efforts. Amethyst asks if Lord Garnet is at his domain, and Laral tells her that all the nobles are at a convocation in the new Diamond Temple. 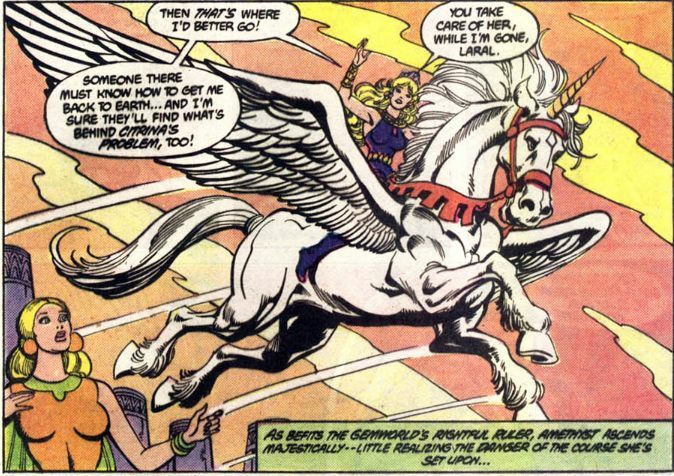 Amethyst decides to travel there in order to get help going back to Earth. She doesn’t stop to help Laral secure Citrina. What happens if the witch-mother starts floating again? Maybe Laral will tie a string to Citrina’s ankle and tether her like you would a floating balloon. Laral could even rent sleeping floating Citrina out for birthday parties. Yellow is a festive color! A fisherman named Quaar from the Aquamarine Islands sees a monster going after his catch. His boat almost capsizes and he realizes he’ll have to kill the creature in order to save himself. He slays it with a harpoon. Quaar’s wife and children see him coming into the harbor with the monster lashed to his ship. All the fishermen are happy with the unexpected feast, and a wise man says that the gathering has given everyone the opportunity to plan to overthrow the rule of the brutal Lord Aquamarine. A new ally will make everything possible. Old Yuhr thinks that Quaar may be the leader the people need. A guard of Lord Aquamarine’s comes to break up the group. No group larger than three people is permitted to gather after dusk. Old Yuhr is defiant and the guard hits him. Quaar has had enough and he attacks the guard. Flames suddenly appear. It is Fire Jade! She says she’s here to free the people from tyranny. Her real goal is the destruction of the Gemworld! Amethyst is nearing the Diamond Temple. She spots Lord Aquamarine and Lady Turquoise flying away together on a giant bird. Prince Topaz flies up saying “Lady Turquoise! I have come for you!” He swats Turquoise off the bird and she begins to fall. He catches her in midair saying “There is nothing to fear dear lady…there is only magic..the magic that will always come to rescue such as we. The magic that joins two souls together with its tender touch!” He conjures up some bubbles to break their fall. Turquoise isn’t suspicious at this sudden change in Topaz’s personality. It has to be horrible being a 13 year old girl trapped in a 20 year old body when you see your older boyfriend giving another girl a kiss that causes her to do the raised leg move. The Gemworld is harsh! Fire Jade is hanging out in her cave cackling around her bonfire. She’s happy that Topaz is following her clever master plan. She wasn’t expecting Amethyst to appear, but is delighted that she’s been turned into a whimpering child after seeing Turquoise and Topaz embrace. Fire Jade is certainly inscrutable. 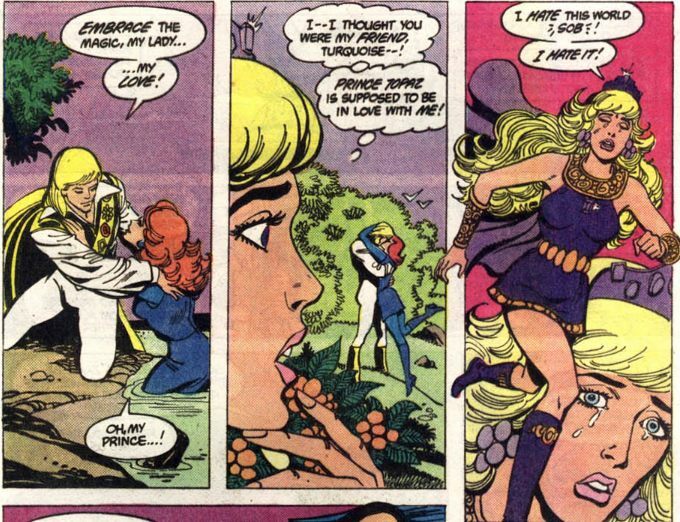 I’m not sure what she’s going to accomplish by pimping out Topaz, but I guess she has her reasons. The fisherfolk have begin their rebellion against Lord Aquamarine. They storm the castle with improvised weapons. 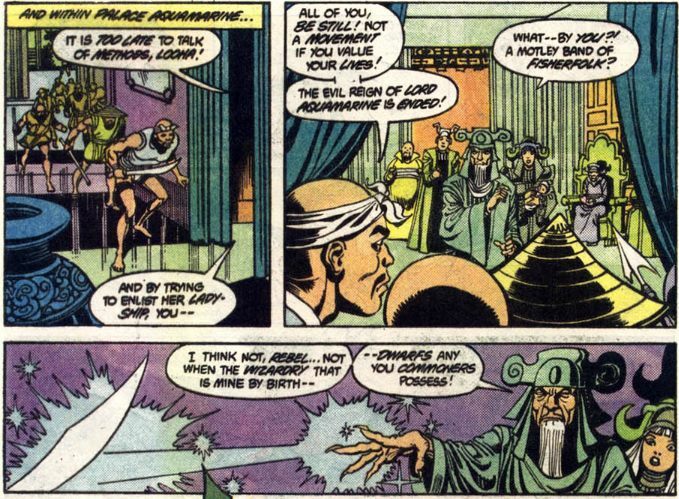 Quaar has some sorcery borrowed from Fire Jade. 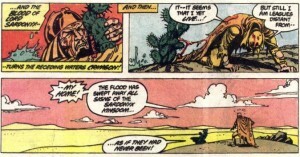 He hurls a green globe towards the guards and a giant monster appears. As he rushes to the castle he assumes that Fire Jade’s magic will just delay the guards. He doesn’t see the monster kill them. Quaar confronts Aquamarine’s sorcerers. Fire Jade continues to gloat in her cave. Outside the Diamond Temple, Lord Garnet is worried about the nobles’ lack of unity. 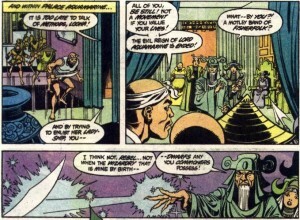 He shares his concerns with the Diamond Priest, Lord Moonstone, and Lady Emerald. Amethyst leans on a tree, thinking how unfair it is that she was forced to be Amethyst instead of Amy. 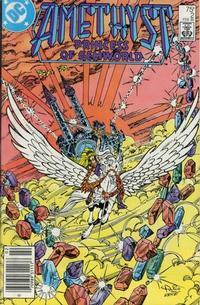 She tries to open up a portal to Earth to see if it is possible to journey there from the Gemworld. A bat-creature dives through the portal, escaping the realm between Earth and the Gemworld. Amethyst grabs the creatures tail and flings it through the portal, quickly closing it. She settles down do commiserate with some nearby faeries and dwarfs when the Diamond Priest spots her. On Earth, Amy’s mother is calling her. The Diamond Priest says that there must be a reason why Amethyst is back in the Gemworld. Her leadership is needed again. Amethyst fades away briefly. Mr. Winston tells Mrs Winston to stop yelling, she’s making Amy toss and turn. Amethyst rematerializes, saying that she thought she was on Earth, but that must be wishful thinking. Garnet is happy to see Amethyst again. Lady Emerald asks after Emmy. A mysterious satellite hovers above Earth containing Lyla and the Monitor. They observe the sleeping form of Amy Winston radiating power. No! 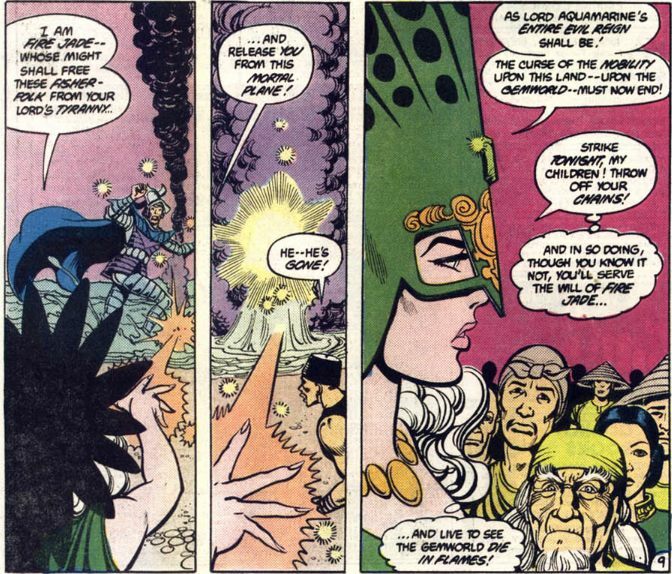 It is some foreshadowing of the Crisis on Infinite Earths! Sardonyx rides a lizard through the inhospitable desert landscape of his kingdom. He spots a flower in a oasis and goes to pick it for his wife. The pool turns into a violent whirlpool which starts to swallow the sands. Sardonyx hugs a cactus to prevent being swept away. 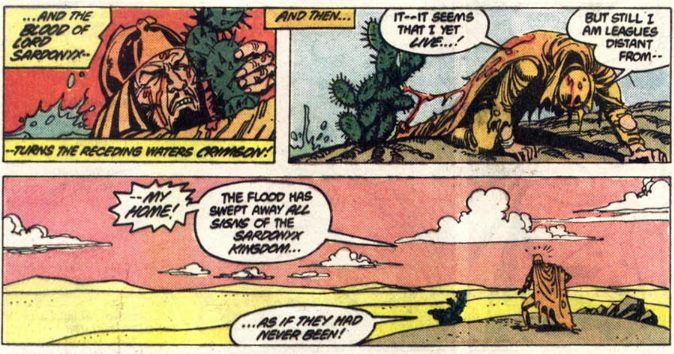 When the waters recede Sardonyx discovers that his entire kingdom has vanished as though it never existed. A horrible storm starts over the Diamond Temple. Lord Garnet tells Amethyst that they have to run for shelter. He fears that the storms may be a signal of the end of Gemworld! Eep! This entry was posted in comics and tagged Amethyst Princess of Gemworld on 9/23/2008 by Anna.